Resist Barrier Repair Moisturizer contains a unique complex of ingredients proven to remodel your skin by building and preserving collagen, firming skin and protecting against moisture loss. The feather-light, silky texture provides substantial hydration. Improves skin tone and skin firmness. 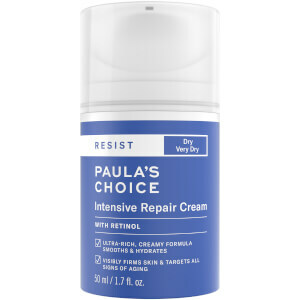 Resist Barrier Repair Moisturizer should be used as part of your daily skin-care routine including cleansing, toning, using an AHA or BHA exfoliant, and Resist Super Antioxidant Concentrate Serum. During the daytime, be sure to follow with a foundation rated with an SPF 15 or greater or follow with a sunscreen rated SPF 15 or greater. Works beautifully as your eye or neck cream. Water, Dicaprylyl Carbonate, Glycerin, Ethylhexyl Stearate, Cocoglycerides, Butyrospermum Parkii (Shea) Butter, Squalane, Sodium Polyacrylate, Lecithin, Adenosine, Palmitoyl Oligopeptide, Ceramide 3, Retinol, Punica Granatum (Pomegranate) Extract, Camellia Oleifera (Green Tea) Leaf Extract, Glycyrrhiza Glabra (Licorice) Root Extract, Tetrahydrodiferuloylmethane, Tetrahydrodemethoxydiferuloylmethane, Tetrahydrobisdemethoxydiferuloylmethane, Tocopheryl Acetate, Chamomilla Recutita (Matricaria) Flower Extract, Glycine Soja (Soybean) Seed Extract, Glycine Soja (Soybean) Seed Oil, Butylene Glycol, Propylene Glycol, Glyceryl Polymethacrylate, Xanthan Gum, Phenoxyethanol. Wow,it is also great,,the only thing I do not like about it is that it does not include a sunsream.